It has finally happened! A new entry in the Devil May Cry series is coming, and it follows on directly after Devil May Cry 4. Without further ado, the Devil May Cry 5 release date has been set for April 2019! It also looks like Capcom is going all out for this one. According to Capcom, Devil May Cry 5 is a direct sequel to Devil May Cry 4. It sees the return of protagonists Nero and Dante, and appears to have shunned the DmC: Devil May Cry reboot as an ‘alternate reality spin-off’. In the new title, Nero is joined by his partner Nico, where they hunt down demons from Dante’s mobile base of operations, the ‘Devil May Cry’. 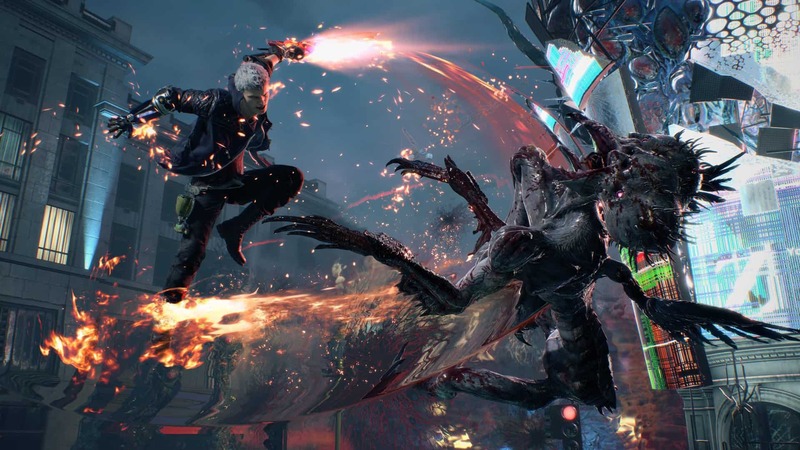 Game Director Hideaki Itsuno returns for Devil May Cry 5 and promises a “return to form” for the franchise. It takes place on earth, as opposed to Limbo, from DmC: Devil May Cry, and will feature incredible details that reiterate the franchises “quality”. Itsuno-san told Inside Xbox that the new entry will also push for photorealistic graphics and that the studio has also reworked animations to keep everything smooth and fluid. It runs on the RE Engine (Resident Evil 7). While I thoroughly enjoyed the reboot, and while the game received generally positive reviews, Capcom appears to havedecided to listen to the vocal few – those made it known that they wanted the old Dante back. This game is clearly a showing of respect for long-time fans of the first four main titles. It seems as if Nero will be the main playable character. However, a noticeable older Dante also makes an appearance at the end of the trailer. How that will play into the story, we will just have to wait and see. Itsuno-san did confirm that a tie-in novel would release alongside the game that details the events between Devil May Cry 4 and Devil May Cry 5. The Devil May Cry 5 release date debuted alongside the new trailer at the Microsoft Xbox E3 2018 briefing. The game should be available in the ‘Spring’ of 2019 – so roughly April 2019. It will be available for Xbox One, PlayStation 4 and Microsoft Windows. Axe or gun for the Zombie Apocalypse? Mythbusters has an answer.